Keep your files safely encrypted when you're logged out, and automatically get access when you log in. The free code behind IBM's new security chip. Menace or protector? This fully operational battle station is a 750-node Linux cluster running a custom batch scheduling program. 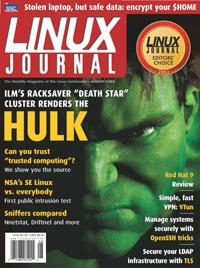 Set visitors loose as root and see what they break—can SE Linux alone keep the system safe? You know it's the secure way to connect to your server. But OpenSSH is fast and convenient too. Need to make a secure connection from home? Set up a simple virtual private network? With all the great Linux stuff introduced in the past year, these are some of the hardest decisions we've ever made.